Pink Floyd news :: Brain Damage - David Gilmour guitar auction - own a historic instrument! 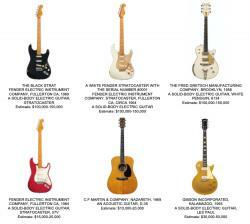 David Gilmour guitar auction - own a historic instrument! Some announcements aren't that unusual, or unexpected. Some, though, come along and take your breath away! Today brought one that firmly falls into the latter category. Christie's Auction House in New York is auctioning highlights from the personal guitar collection of David Gilmour this year, on 20th June. Comprising more than 120 guitars, Gilmour's collection focuses on a selection of his preferred Fender models including Broadcasters, Esquires, Telecasters and Stratocasters, led by a guitar as iconic and recognisable as the historic performances for which it was used - the 1969 Black Strat. 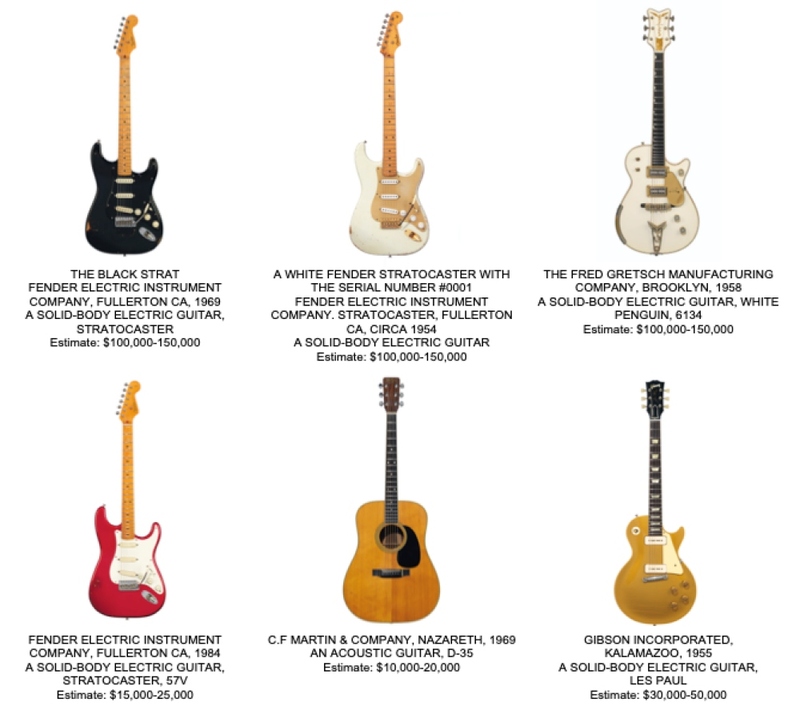 Detailing the musical history of one of the world's most influential guitarists, the sale will be the largest and most comprehensive collection of guitars to be offered at auction. All sale proceeds will benefit charitable causes. Estimates range from $300 to $150,000, appealing to a wide spectrum of guitar aficionados, fans and collectors alike, but we suspect these estimates are fairly modest in a number of instances. Thankfully, and in an excellent gesture to David's fans, a global tour of the collection will launch in London at Christie's (London, United Kingdom) in King Street from March 27th-31st where the full collection will be on display, followed by a display of highlights of the collection in Los Angeles May 7th-11th, and then there will be the New York sale preview (ahead of the auction itself) from June 14th-19th. During the exhibitions, the sound experience will be provided by Sennheiser. David explained: "These guitars have been very good to me and many of them have given me pieces of music over the years. They have paid for themselves many times over, but it's now time that they moved on. Guitars were made to be played and it is my wish that wherever they end up, they continue to give their owners the gift of music. By auctioning these guitars I hope that I can give some help where it is really needed and through my charitable foundation do some good in this world. It will be a wrench to see them go and perhaps one day I'll have to track one or two of them down and buy them back!" More details, including the tour of the exhibition, can be found at www.Christies.com/DavidGilmour.